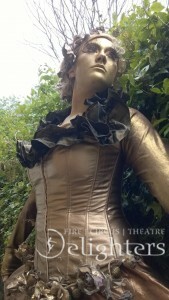 Living statues have a long history in the European Street Theater tradition. 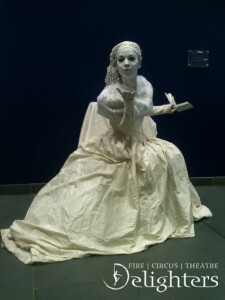 You can see human statues of fabulous appearance in squares and parks of many cities. If you wish to bring our Human Statues to your event, they are great surprise, entertainment and a little extra to please your guests or clients. When they come to life they can perform tricks, can give out freebies, flowers or promo material, as well as holding props to tie in with the theme of your event. A beautiful, serene lady in a white dress, deeply engaged in her book. Until she comes to life to be cheeky and humorous, performs as mime or reads aloud from her book: The Fifty Shades of White. She is sometimes seen without her book, giving out little messages of wisdom or being frozen in the middle of a dance. She is also a great dance partner when she comes to life! 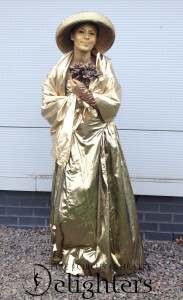 This gorgeous golden lady will surprise you when the least expected. She is a great mischief maker in the disguise of sheer beauty and grace. It all starts with a wink. A summ ery bright character perfect for garden parties, weddings and special occasions. She is classy and funny, can stay very still or be a roaming walkabout act. And she might just gets out her hula hoops!